This is one of several small compositions with a single female figure that Millais painted in 1854. There is much debate about the sitter of this painting. Some believe it to be a portrait of Effie Gray, Ruskin's wife at the time who later married Millais. Others believe it to be Annie Miller, who modelled for Millais. The painting was first known under the title of 'The Stile'. Although Millais achieves a harmony between the depictions of young womanhood and the beauty of nature, Victorian convention frowned upon young women out alone and the sitter's uneasy pose and her situation may have appeared fraught with danger. The walls act as a boundary, a control often symbolising virginity. 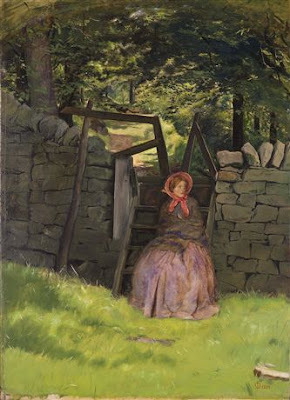 The woman sits on a stile, a point where she could breach the wall entering the woods with her lover. Apart from these implied ideals of the time there seems to be no narrative attached to the work.